How did moms survive before wipes were invented? I swear, I use those things for everything. Hands, faces, feet, bums, door nobs, floors, high chairs– I could go on forever. They are just so convenient and they get the job done without increasing my laundry load… Don’t get me started on my laundry load. I probably have a package of wipes in every room in my house, and of course in my car and in my purse for messy emergencies while on the go. My baby is just entering the world of baby food which is a very messy experience that we always follow up with a good wipe down. And now that it is summertime, there is nothing better than a package of wipes to help you deal with a bunch of kids covered in Popsicle stickiness. I recently calculated how many diapers I have changed to date as a mother– kind of a depressing/impressive statistic all at once to consider. If I average it at 5 diapers a day per kid, I have changed around 21,000 diapers thus far, and I am not even close to done yet. 21,000 diapers people!! That is a little staggering. And slightly nauseating. When I think about that, I can’t sing the praises of the inventor of wipes loud enough. Try changing a messy diaper with toilet paper and you’ll start singing right along with me. I’ve always used unscented wipes because I feel a little nervous about how my babies new skin will react to perfumes and other chemicals. I hate not knowing what I am putting on my baby’s skin. Unscented wipes- while not completely natural- just seemed like the best option they had available for me. 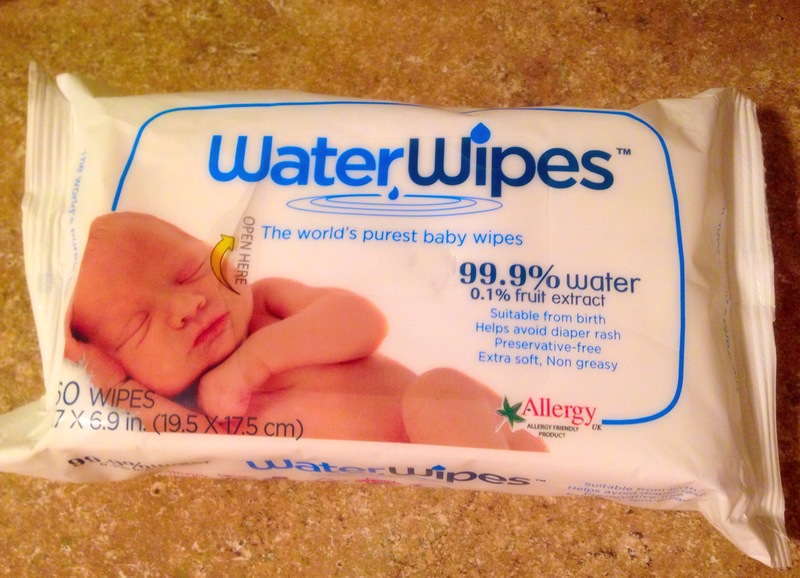 So, when I heard about WaterWipes, a premier European brand coming on the scene here in America this summer, you can imagine how excited I was to find a chemical-free wipe option that only contained 2 ingredients- 99.9% pure Irish water and 0.1% grapefruit seed extract! I have had great success in using grapefruit seed extract to stop a cold in its tracks, so I found it interesting to see it being used in this application as well. I went to my nearby Babies “R” Us to pick up some WaterWipes so I could test them out. I found the display of them right up front by the register, which was convenient. After avoiding chemicals and perfumes, durability is next on my list of most important qualities in a baby wipe, so I was hoping they would pass my durability test as well. I was not disappointed. They are strong and soft- which is an excellent combination in wipe. Just as not all toilet paper is the same, neither are wipes. You can definitely tell a difference in a good quality wipe and a bad quality wipe. If it costs you a dollar at the dollar store, that is probably what it is worth. 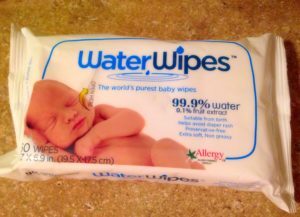 Trust me, after using #WaterWipes, if your baby could thank you for your choice in wipes, they would. You may be thinking- well they must put chemicals in other wipes for a reason. Will they not last as long? WaterWipes will last 15 months unopened, and they recommend you use up your package within a month of opening it. I don’t know about you, but a package of wipes would never last a month at my house! We use those things like they are going out of style! 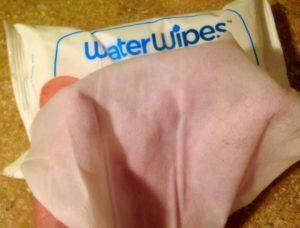 And WaterWipes are not interfolded like other brands which helps preserve the sterile environment of the wipes in the package. 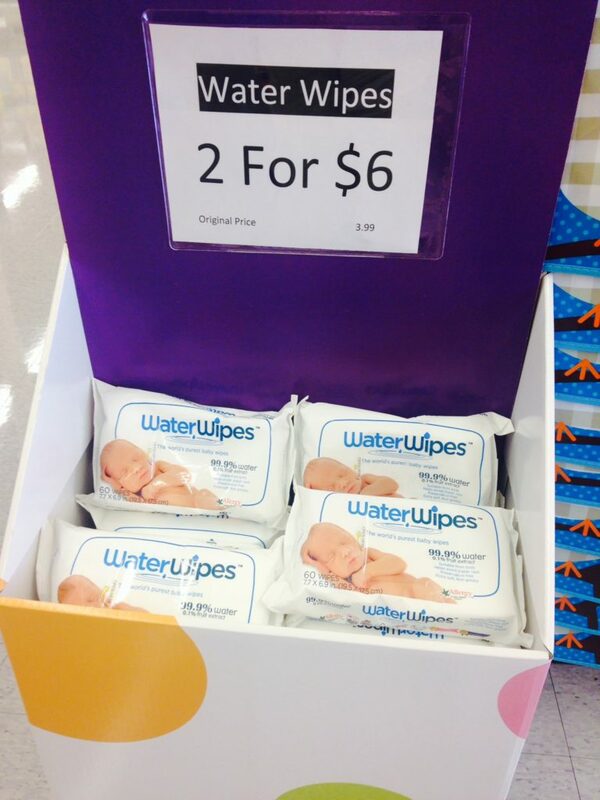 As you can see from the display, Babies “R” Us has a 2 for $6 deal going on– making WaterWipes not only safe and durable, but affordable. I would take advantage of that and stock up! And until July 8th, you have a chance to win a $100 Babies “R” Us gift card for becoming part of the WaterWipes community! Just enter below!